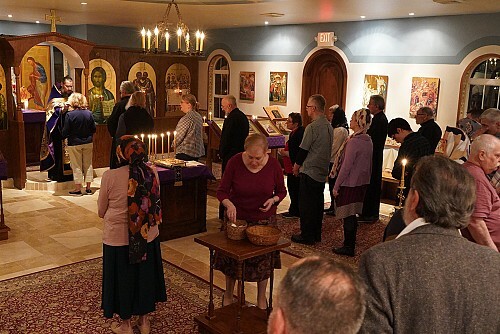 On Sunday, March 3rd, with the blessing of our diocesan hierarch, Metropolitan Tikhon, the 2019 Parish Council members were installed into office. During the first meeting of the 2019 Council, Larry Perrone was elected Junior Warden and Beth Keller Dunbar was elected Secretary. May the Lord bless them all! On Great and Holy Wednesday, April 24th, the faithful gathered for the Mystery of Holy Unction, the anointing with holy oil for the healing of soul and body. The Church’s practice of Holy Unction dates back to Apostolic times, see James 5:14. “The Orthodox Christian Church is evangelical, but not Protestant. It is orthodox, but not Jewish. It is catholic, but not Roman. It is not denominational, it is pre-denominational.